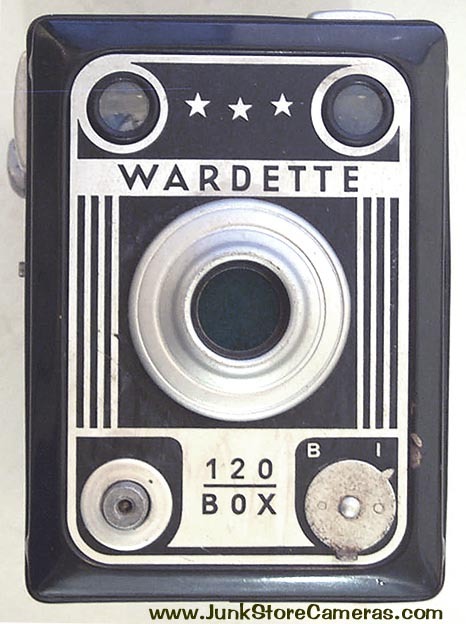 The Wardette box camera … oh boy. Now we’re going to reminisce about Montgomery Ward. 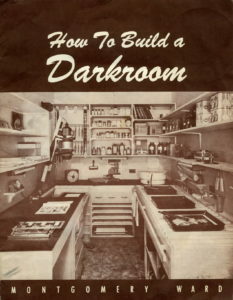 Monkey Ward’s used to have a photo section where they sold cameras and darkroom equipment. 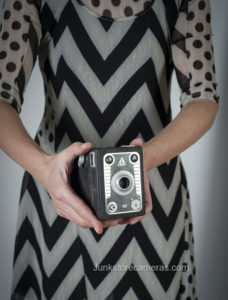 This camera was sold at Montgomery Ward stores and is a typical box camera. I like the patriotic theme, with those stars across the top of the faceplate and the stripes down the sides. 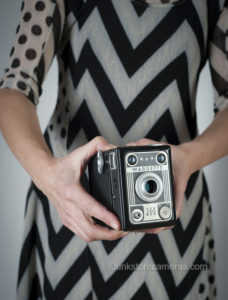 (Time to don my Box Camera Dress!) It’s got “i” and “b” settings. It’s also got these little metal buttons on the sides that you depress. You can then pull the camera open to load the film. It takes 8, 6×9 exposures on 120 film. There are two viewfinders, one on the top for vertical shots and one on the side for horizontal. nice and soft focus… for figure photography! 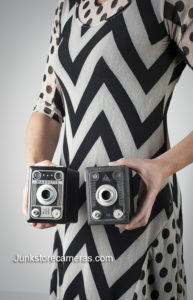 The Wardette and Tower cameras are TWINS! The Wardette’s twin. The Tower Box Camera.